One of my “goals” for this year was to cut down on the amount of food I throw away. To some it might not seem like much but over the course of time it certainly adds up. I’ve noticed that I have a penchant for shopping, food shopping to be exact. Almost every day it’s off to the market to pick up something fresh and no list is involved. You probably can see where this is going by now. Buying ingredients because it’s different or looks great with no follow up does not always work. It’s time for a change……. Saturday night my husband and I picked up some Thai food for dinner. There was not much left the next day except brown rice. Here’s where this dish comes in. First figure out what veggies you have tucked away in your fridge. I quickly learned that wet leftovers, something with a sauce does not work as it will turn your rice to mush. For a great dish you want the rice to be a little dried out, that’s why this dish is always best the next day. To start the eggs are scrambled until almost cooked through. In a separate pan on high heat I used a little vegetable and sesame oil to stir-fry the veggies, then the rice. I finished this dish by adding all the components together and adding a teaspoon of soy sauce. Finish with your favorite hot sauce. Have fun, there are so many possibilities. Preheat wok or large skillet. Add the veggies, followed by the rice, then the scrambled egg, stirring and tossing between each addition. Use your spatula to break up any clumps. Add the soy sauce, and salt and pepper to taste. Stir everything swiftly around the wok until the rice is well-coated and -colored (little bits of color here and there is OK) and heated through, about 3 to 4 minutes. Add more oil if the rice begins to stick to the wok; reduce the heat if it starts to scorch. Taste and adjust seasonings if necessary. 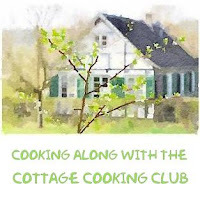 Dear Cheri, all in the spirit of "Love your Leftovers" one of our mottos for our continued cooking adventures with The Cottage Cooking Club - many great tips ans ideas in your post! Our main goal for this year was to cut back on waste too and we are doing pretty well so far. We are eating lots of leftovers! Hi Dannii, leftovers can be really good, sometimes better than the original meal. This looks like a super-fast and inexpensive way to use leftovers-love this idea! I love love love when I can use up ALL the left overs!! Thank Gigi, we are trying, this is something new. We throw out too much food, too. And for the same reason: always buying things that look interesting. And buy more than we can use. 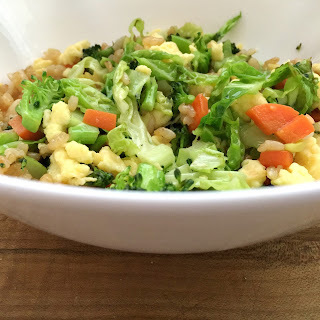 Great idea to use leftovers in fried rice -- such a quick and tasty dish. This looks really good -- thanks. Thanks John, we always make to much as well. Great use of all the leftover veggies, Cheri. I totally understand what you mean. I have such great goals for cooking each week, and then I never get to some of the recipes. I hate throwing food out, too. I love this idea for using leftover veggies. Thanks for the tip about veggies with sauce. Great post! Thanks Shari, I do the same thing too. Thanks Tandy, hope you get a chance. Love your technique Cheri, nice dish, looks delicious! Thanks Peggy, we really did enjoy this one. Fried rice is my all-time favorite comfort food. I got so used to getting take-out from a place close to home years ago that I never made it myself until recently. And, I love that so many vegetables work so well in it! Hi Lisa, you are so right, thats the best part. I applaud you for your efforts in preventing food wastage, Cheri. It's a constant struggle for me because, like you, I'm always at the market and my eyes are bigger than my stomach. I want a little bit of everything! Beautiful dish and great use of leftovers :) Love your pic, too! Thanks Robyn, it is a struggle thats for sure. Have a great week-end! Best way to use left over. Lovely post. Kudos to you for putting leftovers to good use. It shouldn't seem like there should be so much waste in our house with only the two of us and yet there is. I too am trying to be more organized when purchasing and preparing food but, alas, it doesn't always come together as I would like. Your recipe tackles the problem head on and sounds creative and delicious too!!! Hi Louise, well it only solved things for the short term, need to work a lot harder. Take care! yes, I do know that one:) Happy Sunday Louise! A wonderful idea, Cherie, and a good lesson for all to not waste what we have. Thanks Susan, now I have to practise what I preaches a lot harder to do, lol! That looks great, Cheri! I love rice dishes like this and make them frequently. Not even with leftovers sometimes! Thanks Barbara, I need to start making more dishes like this, it's so easy and delicious. Cheri, this is a perfect example of how not to waste in a very wasteful world. Thank you! Hi David, isn't that the truth, everything is so easy to dispose of. Hope you had a great week-end! 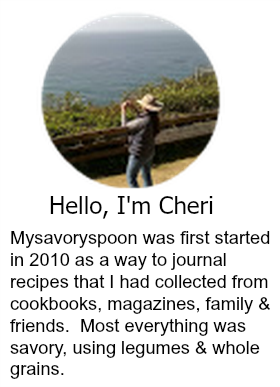 I've been thinking the same thing Cheri - I plan meals and then life happens and I end up throwing away much more than I feel good about. Great way to use leftovers! Thanks Tricia, yes, I'm trying to be better at it. Still not doing enough. Thanks Dena, had a great week-end, spent time in Tucson with my daughter and her family. Thanks Kim, trying to get better at not wasting so much food. I love fried rice---so thanks for putting it back on my radar. For some reason, I never think of re-purposing my leftovers and this dish would definitely be a hit! Thanks Liz, I have not had a lot of luck re-purposing leftovers, but rice is one ingredeint that always turns out nicely.